Knowing college is not for everyone, Mineral Wells ISD has long been committed to making sure students have a chance to learn and are exposed to career opportunities outside classrooms. MWISD has a large Career and Technical Education department giving students knowledge and hands-on experience in areas like agriculture, horticulture, culinary arts, floral design, automotive skills through its six-bay auto tech department, welding, computer-aided design, woodshop and construction, nursing and health care, veterinarian care and more. Not only are students able to gain valuable knowledge and actual experience, but in several of these areas they can can get certifications and embark on their careers immediately after graduating high school while choosing how and whether to pursue their education and goals. Already a number of Mineral Wells High School students have obtained trade certifications through the school's CTE. Within the next two years, the school expects to have 100 students who have obtained specialty trade certifications. 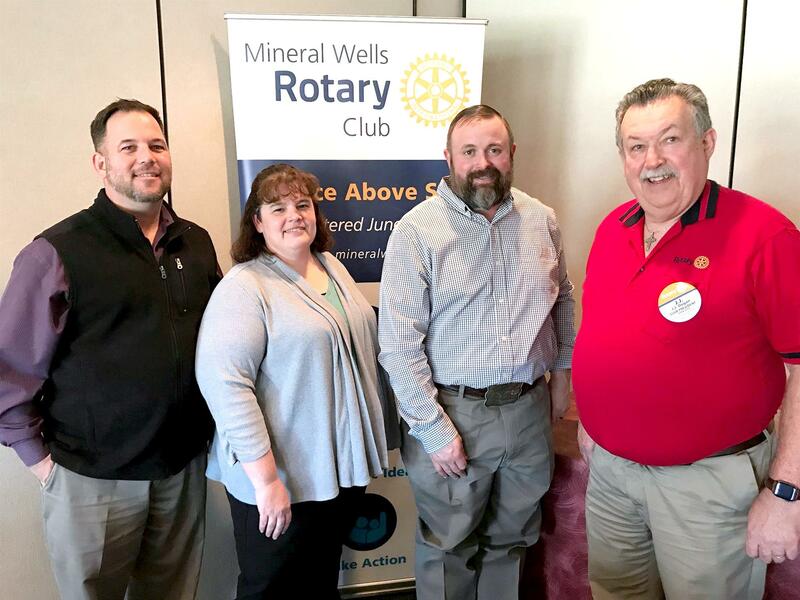 This past Wednesday, Rotarian and MWISD Superintendent John Kuhn, pictured far left, brought CTE Director Deeann Hampton and Agriculture Sciences Instructor Beau Stutts to Rotary for a program on the school's trade and career educational programs. They are pictured with Rotary Club president JJ Dugan, far right. Kuhn said many people in the area are unaware of the massive career and trade programs that take place on the back side of the high school. He said he often hears from parents whose students transferred to other schools that had they known about MWHS' career and technical educational offerings they would have stayed in MWISD. The superintendent said he welcomes tours of the high school's CTE classrooms and work areas, including the greenhouse and shops, by any individuals or groups. Just call the DSC and request an appointment.